U.K. Government Selling Its Share Of Eurostar : The Two-Way The move is part of an effort by the British government to sell off national assets to raise $20 billion by 2020. 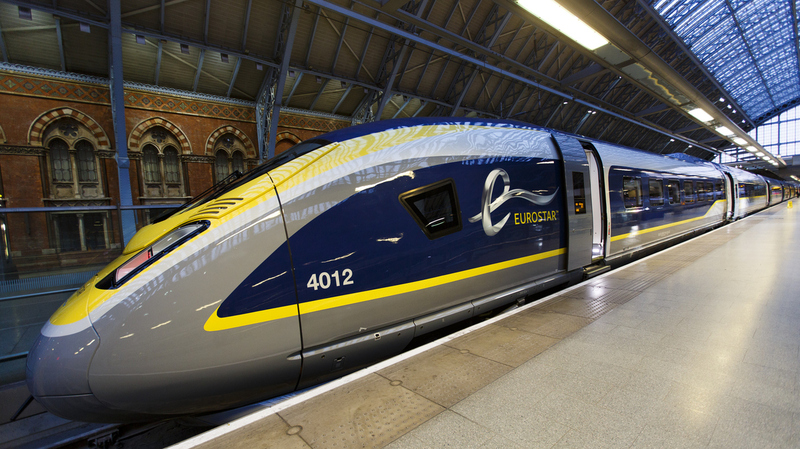 Eurostar unveiled its e320 fleet in November 2014 at St. Pancras Station in London. The British government says it is selling its stake in Eurostar, the high-speed rail service linking London to Paris and Brussels. The government is selling its full 40 percent stake in the company to a group of international investors for $1.1 billion. The move is part of an effort by Chancellor of the Exchequer George Osborne to sell a number of national assets to bring in $20 billion by 2020. But The Associated Press reports that it's leading to criticism that the treasury chief is selling the family silver. The news service quotes rail union officials complaining the policy of selling off national assets harks back to the 1980s, when the government of former conservative Prime Minister Margaret Thatcher launched a major privatization policy. According to Reuters, Osborne said the price tag exceeded expectations. The buyers are Canadian-based Caisse de Depot et Placement du Quebec and the U.K.'s Hermes Infrastructure. The deal, however, could fall through if the other current co-owners of Eurostar, the national railways of France and Belgium, opt to buy the British stake. The Guardian reports that France's SNCF, which owns 55 percent of Eurostar, and Belgium's SNCB, which owns 5 percent, have about three weeks to decide whether to exercise the option, but are not expected to do so. Eurostar began carrying passengers through a tunnel under the English Channel in 1994, after many delays and budget overruns. According to the BBC, Eurostar has since carried more than 150 million passengers — more than 10 million in 2013 alone. Still, the venture has never been the runaway success as first predicted for a number of reasons, including the introduction of low-cost airlines, cheaper ferries and the global recession.